Consuming organic whole grains, beans and vegetables rather than processed foods (often filled with toxic chemicals) provides an alternative method to curing cancer. Unfortunately, raw plant foods and natural therapies receive almost zero attention from the medical industry due to its inability to generate a profit. As a multi-billion dollar industry, the booming business of chemotherapy drowns out the organic and healthy advantages of using a vegan diet as a way to counteract the fatal disease of cancer. And despite providing a cure only 2.1% of the time for adult cancer patients in the United States, chemotherapy is still the number one treatment used. A healthy diet and more specifically a plant based diet can prevent over 60% of chronic disease deaths. However, those diagnosed with cancer continue to be heavily encouraged by doctors, family and peers to seek mainstream treatments like chemotherapy. 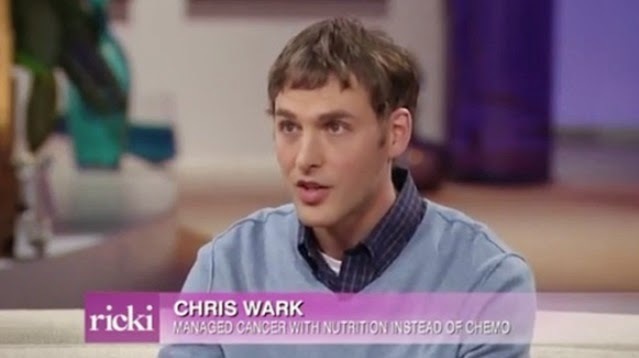 In this short video Chris Wark tells how he rejected chemotherapy and cured himself with a raw vegan diet. At the top of the list of organic food products to consume when attempting to cure cancer are raw fruits and vegetables but in particular tomatoes and dark coloured fruit or veggies such as the purple cabbage or grapes. For a hot drink in the morning and at night, green tea or hot water with a teaspoon of powered barley grass are highly recommended. The decision to pursue alternative therapies is never an easy one as the intense pressure from friends, family and society to undertake the mainstream option of chemotherapy is often overpowering. Pursuing a plant based vegan diet can not only cure cancer within you but also dramatically decrease the chances of cancer, or any other chronic disease, ever surfacing again.